Well, I’m fast approaching my fourth week out of radiation. Still have some itchy skin, and some bizarre throbbing pain every now and then that I assume is a sign of continued healing. They said the radiation would keep affecting me for 2 weeks after we actually stopped, and it did. However, I was so anxious to return to a regular schedule, I might have not been as patient as I should have work-wise. As a result, by the end of the week, I’m beat. I keep swearing I’ll sleep all day on the weekend, but I seem to live in a sports bar, with all day college football games on Saturday so that’s not really happening. Even without the sporty-sports, I start getting antsy after 9:00AM and feel as though I’m wasting a perfectly good day. Currently, everything feels surreal. Each day I hear about something that happened since May or June, when all this started, but I have almost no recollection of it. I feel as though I’ve gone through each day sleepwalking. Hopefully, I’ve been functioning somewhat, anyway. I know I was TRYING. I have neglected to report an event from two months ago. I just couldn’t address it until now. To add insult to injury, our sweet Daisy doggen became ill suddenly and had to be put to sleep. Cancer strikes again. We STILL haven’t recovered from THAT emotional devastation. Maybe it’s multiplied by Robert’s and my lowered immunity to bad news and almost psychotic need to have SOMETHING be normal at this point. During that dreadful day, when the chips were down, my friends responded like they’d been waiting for an opportunity to rush to the rescue. “The Duchess” and Tony W came to stay with Gracie, the basset we adopted so she and Daisy could be little old ladies together. So much for that genius plan that lasted all of 8 months. Robert, Austin and I stumbled, bleary-eyed and in a state of shock, into the vet clinic to say goodbye. By the time Daisy drifted to sleep with Robert reassuring her and all our hands on her, I thought none of us would be able to get up off the floor, maybe ever again. As a result of the glorious past… 5 months(??) I get really emotional. Not sure if that’s the medication, or if it’s the experience(s), but I really want to take some time to sit still and figure out what all has transpired. Punch drunk, I guess you’d call it. Mostly, these days, I’m looking forward to a time when my eyes stop welling up, I’m looking forward to having energy, and I’m looking forward to the END of this year. I’m hoping this doesn’t sound too negative. I’m also grateful for the support of family, friends, readers and visitors. Also, (most importantly) my Robert has been amazing, and wonderful and has had to deal with a lot of crap. So, if I haven’t said it enough, you rock, mister. Sweet Daisy doing her impression of Rose in the Titanic movie. Congrats on finishing RT! That’s great! Hoping for continued healing and lots of good rest for you and yours. And I’m so sorry about your Daisy! 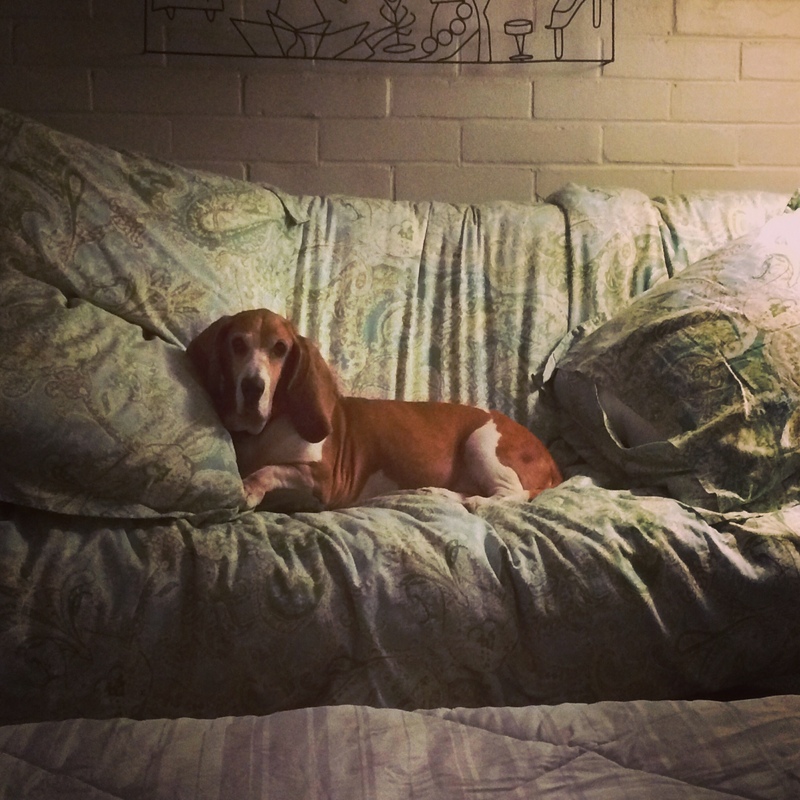 We recently lost our old basset-girl, Fred. She was just this drooly sweet, goopy cuddly, frito-smelling love incarnate character – until one day she was suddenly ill, and needed to be put to sleep. Heart. Broken. So sorry for your loss! My heart hurts for you all and your loss. Keep blogging and sharing. So many people love you and your unique spin on the world so keep writing, and don’t worry about sounding negative. It’s not. It’s authentic and real and we can all relate. Thank you for the words of encouragement. 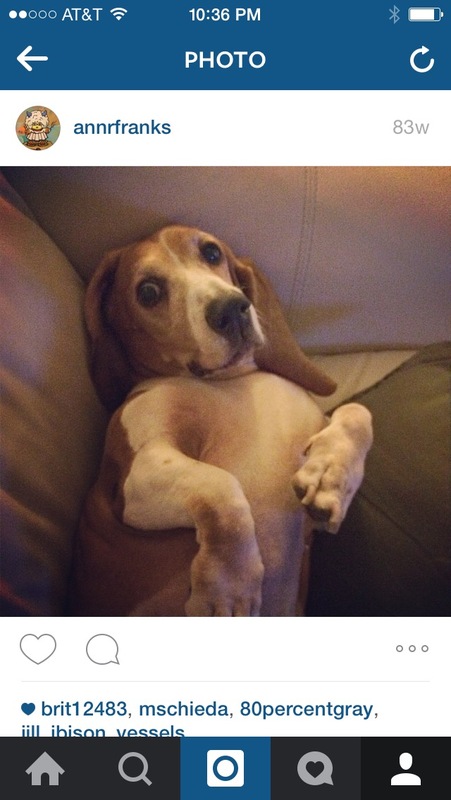 Love your late-basset’s name. They’re the best dogs, and friends, if you ask me.